Home | Events | Derma Aesthetics Awarded a Win & a Highly Commended at The MyFaceMyBody Brand Awards! We are thrilled to announce that we have won the Best Customer Loyalty Program Award and Highly Commended for Best Customer Service by a Manufacturer or Supplier at the annual MyFaceMyBody Global Aesthetic Brand Awards for 2017. 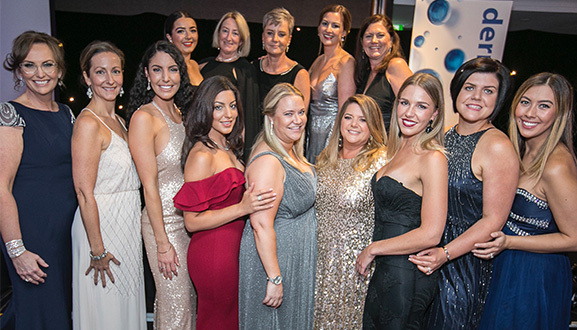 The MyFaceMyBody Awards is the largest and most internationally recognised awards program recognising and rewarding aesthetic practices and brands for their customer service excellence. These awards really are a tribute to our team who have such a passion for what they do and truly believe in why we do it. As a brand, we have come so far over the years and we have even bigger and better plans for the year ahead, so stay tuned! Entrants needed to demonstrate a true understanding of their customers’ needs through the delivery of a customer service loyalty program. The panel judged this award based on achievements and initiatives that showed proof of the impact of an innovative customer care strategy on retention levels and customer satisfaction. At dermaviduals, loyalty programmes stem from their highly regarded dermaviduals Diamond Reward VIP Programme. This initiative demonstrates their appreciation for the loyalty of dermaviduals partner clinics. The judging panel looked at the following criteria for the manufacturer or supplier to excel in the following: quality customer service and support, an excellent user-friendly website, offering marketing tools and more. When dermaviduals partners with a clinic, the team believe it is the start of a strong and supportive relationship. Past the product, dermaviduals provides the complete package with everything a clinic owner requires to succeed but doesn’t necessarily have the time to focus. Examples include quality marketing material, social media support, menu descriptions, in-clinic training, webinars, access to global education experts, VIP events and more. With everything else taken care of, the clinic owner & their aestheticians can focus on what they do best: corneotherapeutic skin correction. Thank you to everyone who took the time to vote for us – we sincerely appreciate each and every vote!